Sterling Flatware is something that’s passed on from one generation to the next. There are other ways of preserving family histories and lost connections. Who knows you’d be receiving a handsome amount of money as resale value. Instead of wasting time and efforts on advertising, you’re welcome to sell them to Unload Your Gold. We are a full service jewelry and metal buying company and we’d provide you with a fair and no obligation quote. Our expert staff personnel understand the value of different designs and patterns. We have spent many years in the sterling silver flatware buying business. In the recent times, silvers prices are moving higher on a consistent basis. Many people are simply unaware of the value of their sterling flatware possessions. Old knives, forks, spoons, bowls, tea sets, mugs and teapots may provide them with a decent sum of money. With this sort of financial backup, it may be possible to settle different needs. We’d make sure the strictest of professional and ethical standards are met with our fair pricing policies.Trophies, flatware items, claret jugs, center pieces or silver jewelry are also accepted by us. We are buying silver almost every single day and make sure the process is simple and hassle free for you. Sterling silver of all categories and makers are accepted by us. In many cases, we’ve managed to offer high prices for rare, unusual and unique items. If you’re willing to sell your silver, we can also offer you with special deals. Many houses unnecessarily stock silver made ornaments, clocks, cigarette cases, boxes, souvenir spoons and coins. They keep on aging with wear and tear throughout the passage of time. You may get in touch with us to sell them and make the most of rates we offer. Often fine pieces and attractive designs have excellent resale value. For example, old war medals can fetch you a good amount of money singlehandedly. Many people go through financial crisis at one stage or the other. There is no point in losing hope for one door closes to open another door. In case they have old silver items in average condition, it would help in raising a useful sum of money. 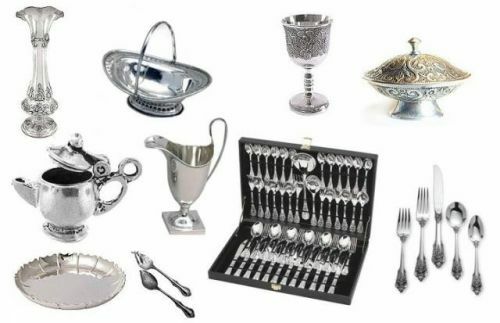 Sterling Flatware items like sugar shakers, cups, salt and pepper shakers, flasks, perfume bottles, urns and wine coolers also have a decent resale value. Market prices may not give enough hope but we can provide you with a rate you’ve hardly imagined. You are welcome to check and compare with other buyers. More often the used pieces may feature minor scratches and small dings from use. Who knows anything below it may let the value fall significantly. We assure you the non-involvement of any middlemen to make sure you’re the one to make maximum profit. Some of the clients come to us with unused and originally wrapped pieces. We deal with all kinds of clients ranging from individual sellers to professional antique sellers. If you have any question or query, feel free to contact us.